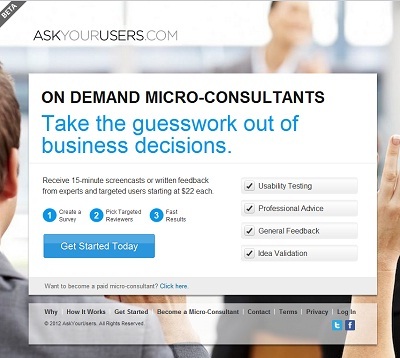 Askyourusers.com is a new crowdsourced solution among small business ideas. It’s a new twist on crowdsourcing that can help facilitate the market research process on a smaller budget. Prior to this small business idea, market research has been conducted by in-person focus groups, recruiting from Craigslist and formal surveys. Now, entrepreneurs will be able to get “micro-consultations” for their small business ideas. They will be 15 minutes duration for about $22 on average. It’s a quick way to vet small business ideas. Per their website, other uses are usability testing, professional advice, general advice or small business idea validation. They initially plan to find users through LinkedIn. But after a month of development, we were still trying to validate the idea in order to feel comfortable spending our time and money building the prototype,” she says. “The validation process was time consuming, expensive and we weren’t finding the right people to talk with or getting objective feedback. AskYourUsers.com is the tool we wished we could use – but it didn’t exist. We determined that the value in it made AskYourUsers.com worth developing even if only for our own use. Quickly, it made clear business sense as well. We were surprised to learn how inefficiently other startups were conducting their market research, holding focus groups and learning about their customers’ needs/interests. Small business ideas that help owners do what they need to do more efficiently at a lower cost will always be welcome innovations. The sweet spot is creating enough value while keeping that value sufficiently uncomplicated. Most small business owners aren’t going to be doing market research very often so the interface needs to be simple enough that they don’t have to relearn a system every time they need something. From the look of the website, AskYourUsers.com seems to have accomplished the simple interface and made a valuable addition to small business ideas.